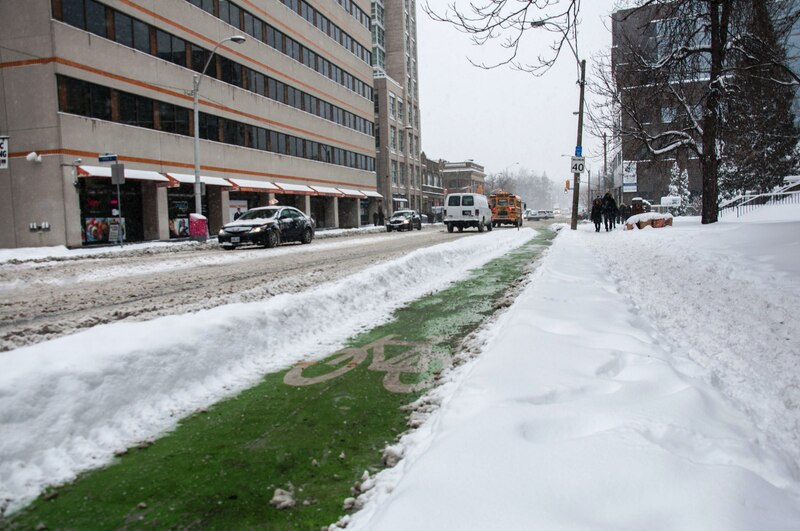 Last year, the City of Toronto renewed it's snow clearance contract, which saw some positive developments in tactics to handle winter maintenance for bicycle lanes. Included in the new contract are a set of bicycle routes that will be prioritized in roadway clearing and given the same level of treatment as many roadways; the cycle lanes will be plowed after 5 cm of snow if it's still snowing, with the goal after plowing and salting to be bare pavement. Priority bike routes for snow removal. 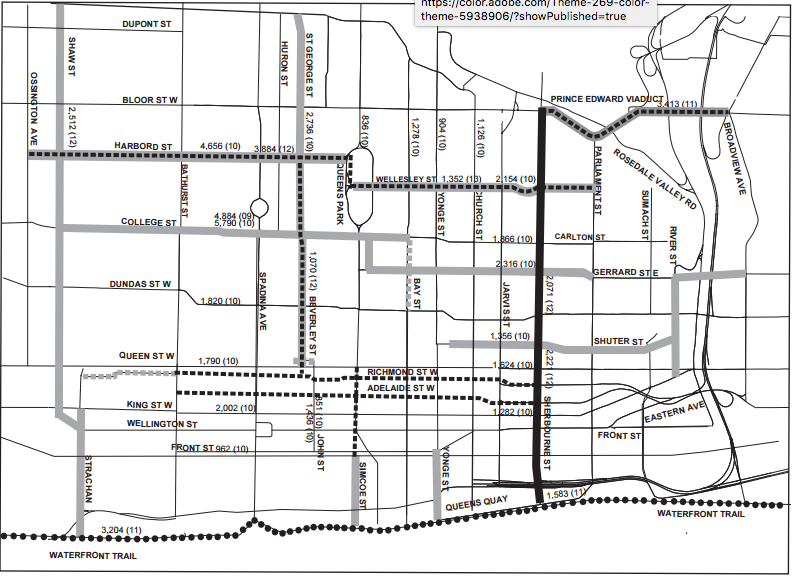 The priority cycle lanes include the Martin Goodman Trail, Sherbourne and Roncesvalles, Harbord and Wellesley, Richmond and Adelaide, Beverly, Queens Quay and the Prince Edward Viaduct. Sharrows and contra-flow lanes are also getting more attention, including Shaw, St. George, College, Spadina, Simcoe and Shuter. Hector Moreno, the manager of road operations is confident in the strategy to handle snow removal in the city, including bike paths: "We are well prepared to respond to any snow events with new equipment in order to meet City Council approved Levels of service for all road class, bike lanes and sidewalks." 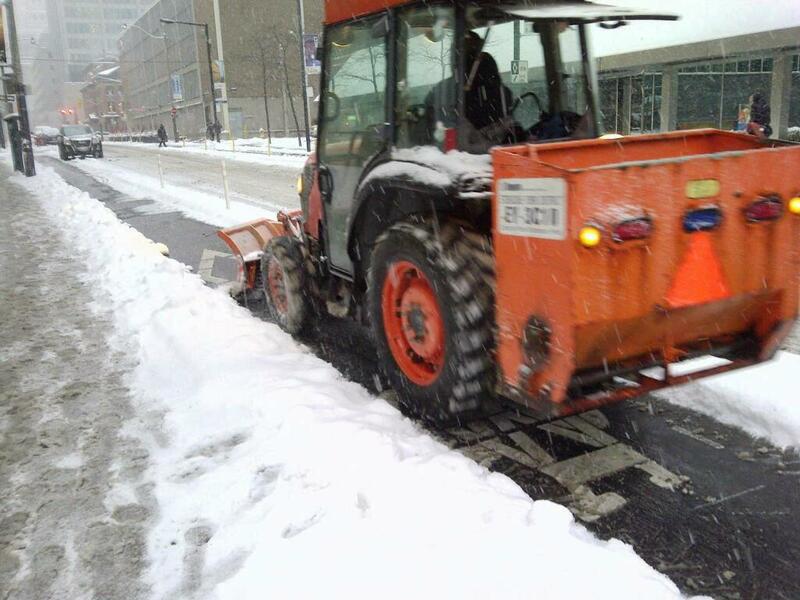 The total budget the City works with for winter maintenance is $85 million – and $650,000 per season has been designated under the new contract to clearing snow from bike paths. The extra money is especially helpful for stronger, less frequent storms – Type 2 or greater – when more than 5 cm of snow falls. Early this year, in January and February 2015, a pilot snow removal project was launched to test methods and equipment and see exactly how these lanes would be cleared. For the most part, Moreno says, it was a success – city staff met the objective to achieve a bare pavement within 48 to 72 hours of snowfall. "Having said that, most of our activities were concentrated on de-icing of the bike lanes with multiple rounds of salt given the harsh and prolonged subzero temperatures endure during the months of January and February." Plowing and salting is still key to snow removal. The separated bike lanes and cycle tracks downtown will have specialized equipment, like the photo above. Other bike lanes and sharrows will be plowed and salted using the same equipment as the adjacent roadway. "Salt is the only material used to de-ice the roadways and bike lanes." Moreno says. The roadway crews will salt the bike paths frequently after snowfall to "break the bond between snow and pavement," but remain environmentally sensitive regarding salt usage. The crews will also make use of "slushers" blades on plough trucks to agitate the snow making it easier to plough and remove the packed snow. Although it's still early in the season, cyclists can finally enjoy the snow knowing that they can rely on the city to clear certain routes. Bike Spotting on Sherbourne St.: Should the City clear this bike lane of snow?